New Name - Intrawest is now "EMBARC-Zihuatanejo"
Weekly Rates include tax and cleaning. A Luxurious Two Bedroom/Three Bath Embarc Villa unit...only steps to the two beautiful pools...or a few steps more to La Ropa beach. Great privacy and security, including a private dipping pool on your private terrace. Sleeps 2-6. Separate children's pool available. Fully equipped kitchen, AC, washer/dryer, flat screen TV's, free internet and wi-fi, gorgeous furnishings and beautiful grounds right on the Playa La Ropa beach!. All arrivals/departures on Saturdays. See Calendar for updated availability. Rates include up to 6 guests....no extra charge. Room tax and basic cleaning included. The most beautiful property on La Ropa Beach. Great amenities, great service....wonderful people. Two great pools....and only a few steps to the sand. A separate shallow children's pool is great for young families while the adult pool includes a swim up bar. EMBARC Viillas most convenient two bedroom Villa unit. Only one level above the pools, and two levels above the beach. Exercise club room on same level... Access to everything Embarc Villas has to offer. Great tiled showers in all bathrooms. All towels provided in unit, and both bath and beach towels. All three bathrooms have showers and hair dryers Outdoor private dipping pool has outdoor shower. Embarc/Club Intrawest has its own private beach area with palapas, lounges and bar and lunch services. This Villa unit is within Embarc Villas/Club Intrawest. Full security, two pools and a private beach are yours. This Villa unit is one level above the pools, and two levels above the beach. The photos in this site were all taken from the unit....so you can see the view of Zihuatanejo Bay. The property is right at the north end of the beach at Playa la Ropa. All linens provided for up to 6 guests. Washer and dryer in unit, with detergent. Temporary parking for rental cars available. FREE Wired and wireless WI FI both available. Bring along your laptop or pad. 'El Pulso' exercise room on same level as this unit....100 feet away. Dishes and utensils for up to 6. Gorgeous dining area off kitchen. Balcony with lounge chairs. Umbrella is available at reception. Fishing boats and water ski boats a short walk down the La Ropa beach. Would be dificult but not impossible. Private dipping pool on the deck to cool off. Two beautiful pools...one for kids, and one for adults with swim up bar and vanishing edge. Minimum Age Limit for Renters: Primary renter must be at least 25 years old. The property doesn't have elevators, so you will be taken to your Villa by Golf Cart. Getting around is easy...up the stairs to the restaurant and reception, down to the pool and beach. This unit is only a few steps above the pool and beach...really convenient. You will love this Villa! Had a 2bdrm Villa unit. Perfect. Thanks. Glad you had a geat time. The two bedroom villa is the perfect place for a family vacation. Come again next year! The staff and property are truly first class. The condition of this unit is excellent. Will definitely be back! 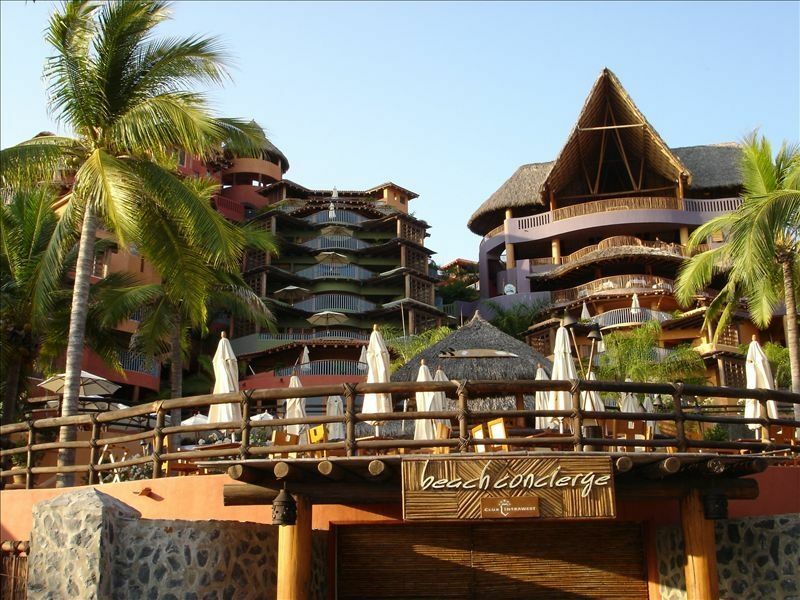 Club Intrawest is a great property on a wonderful beach in a fantastic Mexican community. The town is a nice 20 minute walk away, either by way of a beachside path or a pleasant neighborhood street lined with restaurants. Or you can take a very short taxi ride. Both in town and along the beach, you feel like a visitor, not a tourist. No timeshare hawks, etc. Although we have been to Playa La Ropa many times, this was our first time staying at the Club Intrawest. The unit is very nice, as you can tell from the photos, and it's location just a few levels above the beach is ideal. The food and drink at the Club are both reasonably priced and quite excellent. The unit owner, Bruce, is a very nice, attentive, and easy going guy. And the staff at the Club is super, as you would expect from a resort of this caliber. I highly recommend Zihuatanejo in general, this property specifically, and this unit in particular. Just don't take my week! Thanks! Glad you enjoyed Zih and Intrawest as much as we do. This was my fifth time to Club Intrawest, third year in a row and I enjoy every minute I'm there! The villa is absolutely beautiful, very spacious and has an incredible ocean view! Although there was only two of us each using one of the very spacious bedrooms, there would be room for four or even six very comfortably. Our villa had all the ammenities you'll need to enjoy your time there but if you don't feel like cooking there are many fine restauraunts within walking distance or enjoy the excellent food at the Z restaurant in the resort. There is a lot more excellent dining in downtown Zihuat that is only a cheap cab ride away. The villa was only a few steps to the pool and only a few more steps to one of the most beautiful beaches in Mexico! The service at Club Intrawest is top notch and Pedro and the rest of the pool side bar bartenders will make your week even more enjoyable with their friendly service. Visiting Zihuatanejo is a wonderful safe holiday experience and staying at Club Intrawest in this beautiful villa will only add to it! Zihuatanejo is an old fishing village located in its own almost circular bay. Embarc/Club Intrawest is just south of downtown, at the north end of La Ropa Beach, and built down the entire side of a cliff. The Embarc Villas are dramatic to see and wonderful to stay in. You can walk to downtown Zihuatanejo in about 15-20 min, passing about 12 charming restaurants on the way. Or, take a taxi and be in town in 5 minutes...for about $5 USD. Ixapa is only 8 miles north, with its 24 hr activities, night clubs, great restaurants, golf and a full marina. Zihuatanejo is smaller, quieter....much more Mexico. Other Activities: Shopping, Kayaking, Boating, Parasailing, Wildlife Viewing, Health/Beauty Spa, on the beach massage tables, yoga classes available. Rental wks are Sat to Sat, 7 nights. 50% to reserve-full pay at 60 days. No cancel fee if more than 90 days before travel date. At 90 days or less before travel, cancel fee is $100/unit/week. If you have to cancel within 60 days of travel, we will assist in finding someone to take over your pre-paid week and will refund the replacement rental rate minus the $100 cancellation charge.